SWTOR Level Sync – A Blessing and a Curse? We have had a wee while to consider the impact on the SWTOR Level Sync feature which was casually thrown in part way through the Combat changes blog post. In reality it’s such a big change, it deserved a much more in-depth response to likely questions. 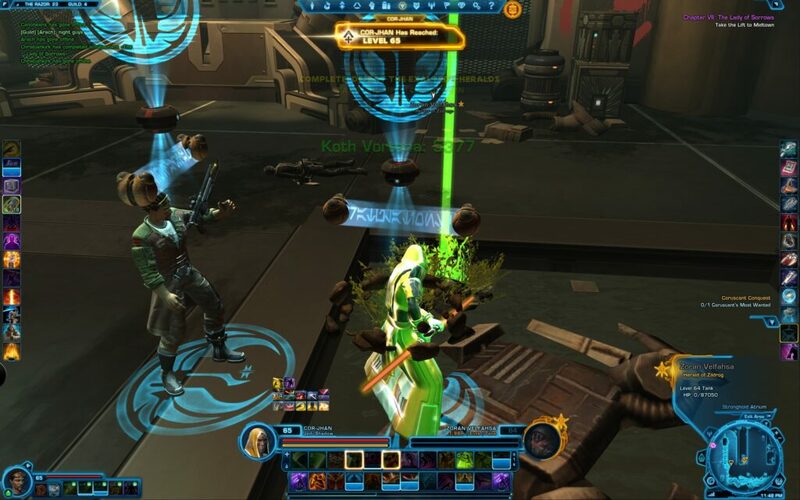 One of the positives put out by the SWTOR team is that you can earn respectable XP for doing a ‘lower level’ mission. It used to be the case that if you were too high for a planet, then you’d get the credits and gear rewards for mission completion, but only 6XP. It seemed fair and meant level progression was tamed to be in rough keeping with hitting L50 by Corellia. Now Level Sync is in play you get the XP relevant for the mission. I haven’t done the maths, but I suspect if you’re the allotted 2 levels above the planetary target level you’ll get slightly less than if you were at or below that. Has anyone out there been more observant to know if that is the case? That aside, if you put level sync in play with the Core World Changes, it may mean that traffic across planets is more evenly distributed. After all, you can gain XP and appropriate rewards for your level by going to do Heroics on, what are currently considered, too low-level planetary destinations. So I think that’s a positive. You can vary your gaming experience and decide to do random missions in the dark on Taris, and still not feel like you’ve lost out. Thank Goodness they didn’t change this – your quickbar would be changing like traffic lights. Although scaled back in terms of damage (or presumably for defence abilities, the amount of damage you avoid) – those core abilities do stay in place. That does help keep your combat sequence consistent across planets. That being said, high level abilities usually inflict more damage, so I have found, even with ability and gear reductions that being overlevelled can still make the missions easy. Too easy sometimes? Maybe. Having this in place may encourage experienced users to group with less experienced users. If they show this kindness (which they probably should from time to time) this may help reduce some of the elitist attitudes you can find in-game. But as that an attitude of mind and not game mechanics, I don’t know if it has worked out in practice. As Heroics are now H2+ rather than H4, the incentive to group has been reduced and maybe even removed. An odd choice for an MMO to be sure, but I personally don’t mind. From the sounds of it, you should be able to find the right scavenging nodes for your level all the time. I heard one player complain that we would have ‘reverse level sync’ and lower level players scavenging on higher level planets. To be honest that doesn’t make a lot of sense. The idea that a L15 could go to Corellia (a Level 47-50 ish planet) and survive seems non-sensical. I think this is more about ‘levelling down’ than up, and that certainly seems to be working out in-game. I haven’t spotted any L10 scavengers on L45-50 planets. But I do appreciate being able to get crafting materials relevant to my level regardless of the planet I’m on. Where you do want to group for the new [Heroic 2+] missions (formally [Heroic 4]) if you can’t find someone on-planet, making a call out to your Guild, for example, will mean that the balance of play between all members of the group is maintained, rather than you L65 Guildie coming and storming over all the mobs leaving the rest of the group running around. That should, for people who like group missions, make it more engaging – and challenging. I’m sure others will have other concerns over this synchronisation of level but my main one is this: the relaxation factor. I have always (even before the Epic Story Boost) attempted to be somewhat overlevelled for a planet. That’s not because I enjoy easy games (a challenge is good) but because I find playing them slightly over the mission requirements more relaxing. This does feed into gaming being my coping mechanism for dealing with Fibro. If I find the game less relaxing, I won’t enjoy it as much. [Update] after plenty of experience under Level Sync (even being over-levelled just doing Class Missions), I haven’t found it to make my gaming significantly harder. This is a relief, and it’s nice to know not all worries/fears about change in SWTOR come to pass! Hitting L65 During the KotFE Storyline. Farming Effect: It will no longer be easy to farm lower-level missions – such as the Black Hole Weekly (though that might be possible if the H4 becomes a H2, but we will see). BioWare would probably argue you can farm them, but they won’t be easy and will take more time. So earning credits and gear (for use or resale) will not be as quick. Not Optional: a few people ask that this be optional. I don’t see how such a core change can, practically speaking, be optional. This could turn some away from SWTOR, but then it could encourage more to play. That’s guesswork at this point, but a few are asking whether it could be toggled off. In fact I still see queries in my website stats. 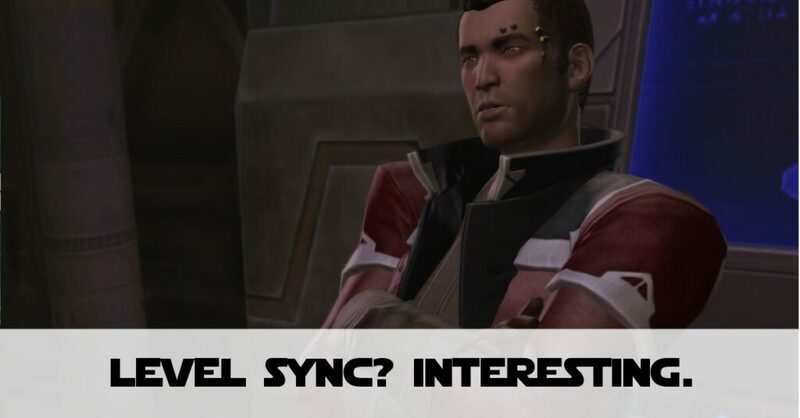 So if you’re asking Can I Turn Level Sync off in SWTOR?, the answer is, no. At least not at this point – and as it’s likely to be a core game feature, I doubt that will ever become an option. Bonus Series: Many bonus series can only be started at a later level (thinking Nar Shadaa on Republic Side and Belsavis on both sides) – would this update make them less rewarding? I initially wondered if level sync was ‘planet wide’ when some planets have bonus series attached to them. Or if you’re trying to get the Shield Bunkers for the KotFE Star Fortresses at L65. Yes, there is a synchronisation of level abilities per planet, but phases and certain areas have an appropriate level drop attached to them. At least that’s what I’ve seen so far. I’m presuming the ‘earning of XP’ for lower planets will be pretty much a moot point, because after playing a chapter or two of KotFE you’ll probably hit L65 anyway and stop earning XP. So I only hope the rewards of re-playing Heroics from previous planets are worthwhile, else they may find the changes designed to encourage players to do that come to nothing. So far I’ve only played actual storyline stuff in KotFE. This weekend I intend to look at level sync a lot further down in the levels. However, in the Fallen Empire story level sync is actually making some sense! So once I hit L65, for example, enemies were of that level. Yeah I lost health in a battle but with being able to set my companions to Heals rather than DPS, it wasn’t fatal. I have found this difficult when forced to fight alone. My first character I’ve played since the game update 4.0 rolled out is a Tank so his DPS is pretty bad. But I found battling foes the same level as me quite manageable. I think I’ll need to invest in Augments going forward, but my intial thought is that battles are more challenging, but not too much. You can now see a ‘level sync indicator’ in-game. It shows your ‘real’ level but then if you exceed the planet/mission’s maximum level, you see a down arrow to say you have been synchoronised with that level. This reduces your DPS and gear ratings but the number of abilities stays the same. The effect of this is that you earn more XP than you would have pre-level-sync. So before, once you hit 4 ot 5 levels above the planet’s target level, you would earn like 6XP to ‘hold you back’ a bit. Now you can gain a lot of XP by completing more missions. The downside to this is faster levelling! But if you want to get to L65 quickly, then doing more side-missions will help you do that. It might disincline you to complete planets further into the Storyline, but that choice is yours! I feel its a big wait a see I been a long time player and seen the highs and lows of swtor. One big plus I see out of this is if your helping a low level friend or guild mate out your not chewing up their Xp gain on this. Have seen this over the weekend where I made a new scor and saw the number of new players asking for help with the 2H and 4H and gave them a hand but they got less xp then they would have with some one there level. I have also seen it implemented in the opposite way. Like for instance, some of the Flashpoints which are lvl 65, like the False Emperor, Battle of Riishi (not the solo one), you’d see a lvl 14 player synced to lvl 65 for the fp itself. This improves your stats, your gear drops. There are two very big downsides to this. The first, is that you don’t unlock the rest of your class and spec abilities even if it’s only for the fp and then they’re removed as soon as you exit the instance. This makes it, and forces you to be only as good as the number of abilities you have abd your ability to use them in combos and your efficiency at those combos. The other problem is that it’s too easy to power level this way. Granted I’m also guilty of doing so, having hit 65 during the start of the Riishi story line, during the SoR expansion. This makes it so that you out level your gear, granted they not be adaptive which would make it so that it takes longer to do so, you gain new abilities. This ends up making the story line and the earlier missions too easy, and then when you end up at 65 you have no gear, no idea how to use your abilities in combos, and thus you can’t do any of the dailies or the higher leveled heroics, and thus end up being carried through by players that leveled before this function was implemented, and thus they actually know what they’re doing. I think you’re referring to the ‘bolster’ buff when doing FPs aren’t you? I didn’t even realise L14’s could even do False Emperor and Battle of Rishi. I wouldn’t even think about doing those FPs. I guess unless you don’t want to do the class story again and actually want to ‘power level’ as you put it. Did/would you do Flash Points at that low a level?